It’s not clear if the presentation describes a specific program that was put into action or whether it was meant to offer general tips for cultivation of sources who could provide information related to al Qaeda in the Arabian Peninsula, al Qaeda’s Yemen affiliate. The document appears to suggest identifying potential informants solely on the basis of their religious affiliation or national origin, which could violate FBI rules meant to curb profiling and discrimination. The document is undated, but from references in the text, it appears to have been prepared around 2010 or 2011 by Centra Technology Inc., a company selling intelligence services. Centra Technology has had regular contracts with the FBI since 2008, including for training courses vaguely described in contract records as “analytic tools and techniques.” Centra did not respond to a request for comment. According to the FBI’s guidelines, investigations involving academic or religious groups are considered “sensitive investigative matters” and require extra supervision and particular rules for deploying undercover officers or informants, as do investigations of mosques. The presentation does not mention any such sensitivities. FBI surveillance of mosques and Muslim communities in the past has generated controversy, as has the bureau’s aggressive use of its army of informants — which grew to over 15,000 in the years after the 9/11 attacks. In 2012, the American Civil Liberties Union obtained documents showing that the FBI had used “mosque outreach” programs ostensibly meant to build relationships with Islamic communities in order to collect intelligence. There is a long-running lawsuit over an FBI informant who was sent into mosques in Southern California in 2006 and 2007. Federal authorities investigating the influence of the Islamic State in the United States have increased their use of informants and sting operations. In the past two years there have been 101 Islamic State-related cases in U.S. courts, and 59 percent of them involved the use of informants or undercover agents, according to a report released in July by the Center on National Security at Fordham Law School. Many of the individuals who actually carried out attacks motivated by violent Islamic ideologies in recent years were known to authorities, illustrating the difficulty in predicting who may become violent. Omar Mateen, who killed 49 people in an Orlando nightclub this year, had been the subject of an FBI investigation involving informants; the suspect in recent bombings in Manhattan and New Jersey, Ahmad Khan Rahami, was reported to the FBI by his own father. 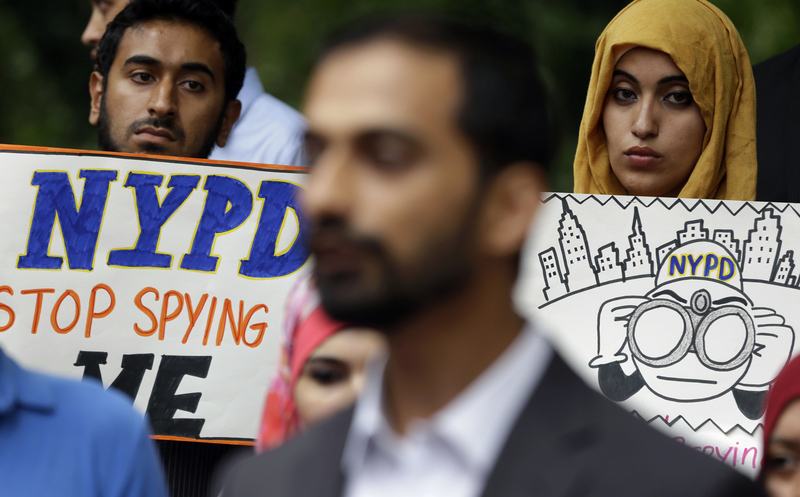 Muslim Rutgers students attend a news conference to address allegations over surveillance of students and other members of the Muslim community by the New York Police Department (NYPD) in 2012 in Newark, New Jersey. 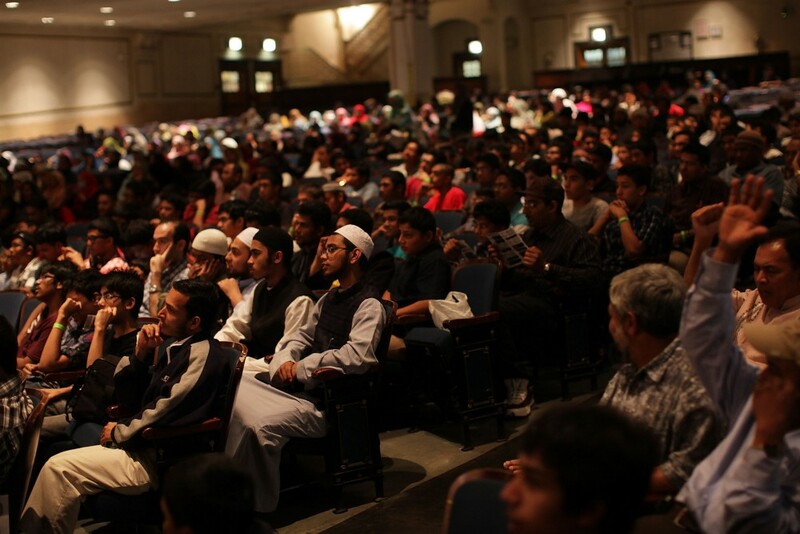 Muslim youths participate in a community group gathering in Brooklyn in 2011. 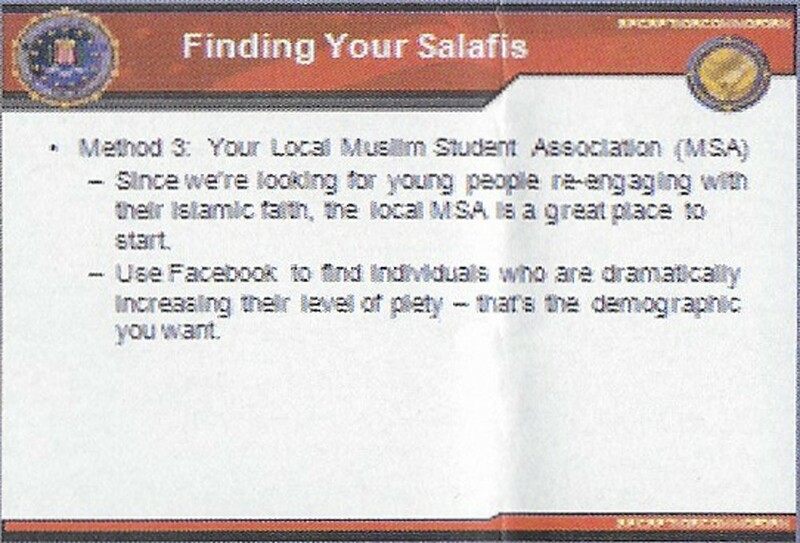 Under headings like “Finding Your Salafis” and “Seducing the Salafis,” the presentation suggests that “existing sources in local mosques should be able to tell you about groups of young Salafis in the community,” and advises that agents take advantage of undercover operations “that capture discussions between Salafis,” study Facebook profiles for signs of increasing “levels of piety,” and target “the local MSA,” or Muslim Student Association. A rally to protest New York Police Department surveillance tactics in New York in 2013. The focus in the document on young, pious Muslim students echoes a now-discredited effort by the New York City Police Department to monitor Muslim student groups as part of widespread surveillance of Muslim communities and businesses in and around New York. The NYPD sent undercover police officers onto college campuses in the city and across the Northeast, and monitored students’ online interactions. Internal records showed that the NYPD was especially interested in Muslim student associations, which they defined as “a university-based student group, with an Islamic focus, involved with religious and political activities.” Some groups drew NYPD interest because they had invited “salafist speakers,” according to the AP, while another had “students who are politically active and radicalizing.” The program was exposed in 2011 and the department eventually disbanded the unit in charge, admitting that it had never generated a lead. “I don’t think there is much difference between this approach and what the NYPD was doing, in that it is identifying religious practice or ethnicity as an indicator of association with terrorism,” said Mike German, a former FBI agent and fellow at the Brennan Center for Justice at New York University School of Law. The NYPD had produced a heavily criticized report that drew a direct link between commonplace religious activity and terrorism; FBI materials from the same time period also described a simple theory of a line from conversion to jihad, and identified mosques and other associations as places where radicalism might grow. German says that the FBI’s current radicalization theory “tends to be more vague about what indicators they should look for, I think because we know there aren’t reliable indicators” of propensity to violence. 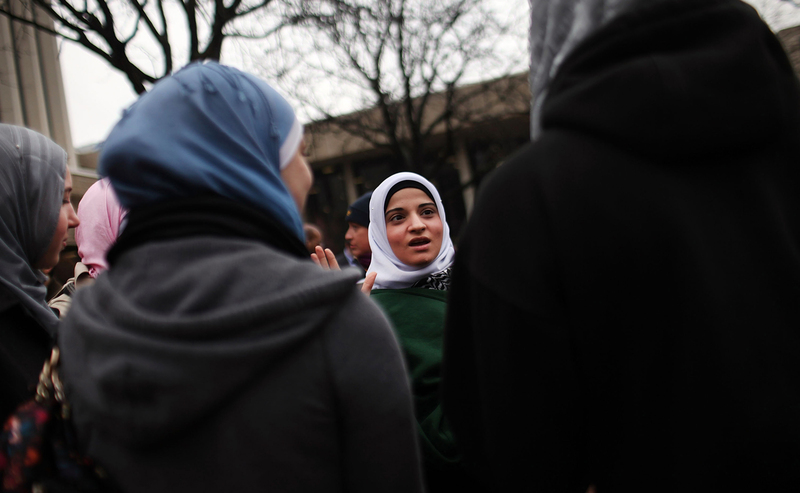 Top photo: Muslim women participate in a gathering of a community group in Brooklyn in 2011.